Assassination Nation is gearing up to hit theaters soon. A new Red Band trailer has been released to get potential viewers excited to see this ultra-violent expose on today's youth. The latest sneak peek is a bloody ride of paranoia and mob rule. It's plotted around bullying, toxic masculinity, drug use, transphobia, homophobia, a lot of weapons, kidnapping, and sexism. Assassination Nation is bound to spark controversy upon its release a few weeks from now. Assassination Nation made an appearance at this year's San Diego Comic-Con, with producer Joe Russo from the Marvel Cinematic Universe and director/writer Sam Levinson raising awareness for the film, which has gotten a reputation online as the "Teen Purge." However, Russo and Levinson revealed that the movie is a lot more than what its reputation implies. Even one look at the latest trailer proves that there is a lot more going on than meets the eye. Levinson has crafted a modern day horror movie that puts the focus on our culture. As for how the Russo Brothers got involved with Assassination Nation, Joe Russo reveals that he and his brother were first a part of the independent scene. Now, the directors are currently two of the biggest in the entertainment industry, coming fresh off of Infinity War and looking forward to the highly anticipated Avengers 4. They've taken their success and put it back into the community that they came up in, starting their AGBO banner to foster new young creativity. Assassination Nation takes place in a small Salem town that has fallen victim to a massive data breach that reveals everyone's personal information, leading the town to go into chaos. The politics of social media that often becomes toxic is on full display. Director/writer Sam Levinson has described the movie as what happens when the comments section comes to life, which sounds pretty scary in our current political climate. Assassination Nation is a satirical dark comedy, mixed with horror that helps to get its powerful message of unity across. Levinson had this to say. "This film is about debate and discourse and how we treat one another. Our level of empathy for one another. No matter who you are or what your background is, whatever our political leanings are, it's about understanding one another." 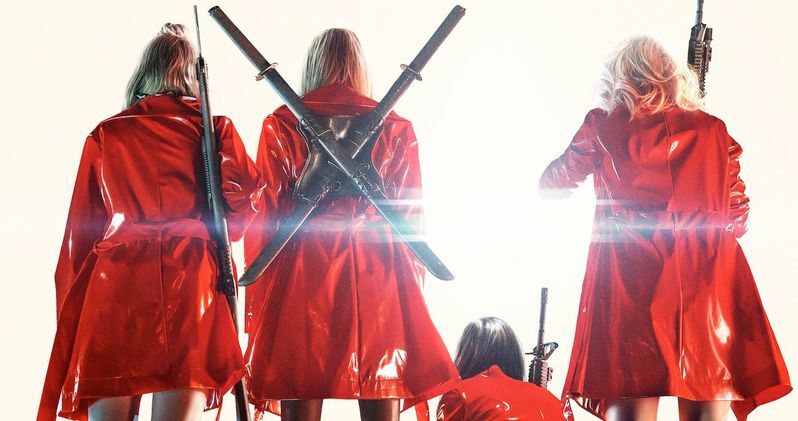 Assassination Nation stars Odessa Young, Suki Waterhouse, Hari Nef, Abra, Anika Noni Rose, Colman Domingo, Maude Apatow, Bill Skarsgard, Joel McHale, and Bella Thorne. The film hits theaters on September 21st and has been getting early praise from critics for its view on the current toxic social media trends as well as its smart dark comedy. It looks that Sam Levinson has crafted something that will strike a nerve with viewers. It definitely struck a nerve with the Russo Brothers who rushed out to get involved in Levinson's clever story. While we wait for the movie to hit theaters, you can check out the Red Band trailer below, provided by Neon's YouTube channel.